Home/Achievement, Charter Schools, Editorial, Education Policy, Professionalism/Where Will John King Stand On Student Suspensions? A lot of the commentary following the announcement by US Secretary of Education Arne Duncan that he would be leaving his post at the end of the year was devoted to praising his apparent devotion to kids. Nevertheless, the “person who cares the most” narrative of Duncan has been cast in sterling silver and wrapped with bows by Beltway operatives, so now it’s up to all us “outsiders” to write more nuanced, analytical commentary about the real effect of the Duncan tenure on public education, long-term. Now enter John King, the interim secretary likely to serve until the end of the Obama administration, and the whole story-telling machine starts spinning anew. This time, the new leader of the federal government’s education policy is being cast as “a man driven by what might have been had he not found refuge in public schools,” according to education reporters at The Washington Post. For sure, King has a compelling life story: an orphan at age 12 who moved from relative to relative and found his local school to be “the safest, most stable and most nurturing place he knew.” With a caring public school as his launching pad, King went on to succeed in Ivy League universities and eventually become state commissioner of New York public schools. King certainly deserves respect and admiration for traversing such a difficult journey. But at what point do we separate personal narrative from policy agenda? Do we let the stories continue to write themselves? To be fair, the Post reporters point out how “polarizing” King was as state leader of public schools in New York. They mention his controversial implementation of the new Common Core Standards in 2013. They report how teachers complained about not having the training or materials to teach to the new standards, and how parents rebelled against the new pressures being put on their children and the huge increases in test prep they were seeing heaped on their kids. But of course those sorts of policy disputes can be justified as necessary when someone “who cares most about kids” meets others who … don’t? Left mostly unexplored, however, is an important difference in the history Arne Duncan carries around with him compared to the one John King totes. That’s not true for King, who has a track record of teaching in schools and eventually founding and leading a school and overseeing a chain of charter schools. With King, there is ample evidence of how he treats children when he has direct control of them. And it’s not altogether a pretty sight to behold. In reporting King’s leadership of Roxbury Prep, a charter school he co-founded in Boston, the Post reporters provide a hint of what a school is like when King is in charge. As the reporters note, the school was famous for having students “who were overwhelmingly low-income and minority” score high on state tests. This achievement brought accolades to King and his school and prompted visits by education thought leaders who wanted to observe just how the magic occurred. From Noguera’s detailed recollection, we get a glimpse into a much bigger story of the kinds of schools John King ran. From his storied success at Roxbury Prep, King went on to help found and lead a chain of charter schools designed to replicate what his first school in Boston achieved. The Uncommon Schools network King helped found and lead quickly became an exemplar of what is commonly called a “no excuse” philosophy of education and pedagogical practice. The origin of this philosophy is most often attributed to a chain of charter schools called KIPP, which has built a reputation for generating high test scores from populations of students who most often struggle to do well on standardized tests. While there doesn’t appear to be a formal definition of this educational approach, there is a common set of principles characterizing the no excuse practice, which include: high behavioral and academic expectations for all students, a strict disciplinary code, longer school hours and sometimes extra days, a stronger emphasis on math and reading (subjects addressed by standardized testing), and a monolithic school culture stressing particular values for all students to uphold. While schools following the no excuse model can vary in terms of how they implement this approach and what sorts of outcomes they produce, the version of no excuse King and his schools practice tends to lead to at least one disturbing outcome. One outcome Uncommon Schools is proudest of, for sure, is the network’s overall results on standardized tests. How does Uncommon Schools do it? Uncommon Schools, like many no excuse charter chains, has often been accused of having student attrition rates that exceed the rates of traditional public schools. The motivation for increasing student attrition in a school is simple: Want higher test scores? Encourage – by overly-strict discipline, repeated academic failure, grade retention, or negative “counseling” – students who struggle the most to leave. Research studies produced by the charter industry itself tend to find attrition rates at charters vary little from those of comparable public schools. However, it should be noted that when students leave a public school, for whatever reasons, they almost always rotate back into another public school, unless they drop out, while students leaving charter schools more often than not end up in public schools. Because charter schools don’t have to “back fill” their classrooms, meaning seats that are vacated in the middle of the year can remain empty, they can benefit from smaller class sizes and grade cohorts while public schools get more and more crowded. Also, numerous anecdotes of no excuse charter schools with abnormally high attrition rates – including examples from some schools in the Uncommon Schools chain – continue to provoke questions about charter school attrition rates. So let’s just say the issue of high student attrition rates in charter schools is far from settled. But what is completely clear is that when John King’s Uncommon Schools are the subject, there is a particular kind of student attrition prevalent in those schools. As New Jersey-based schoolteacher and blogger Mark Weber explains, one significant characteristic of a King-led school is extraordinary high student suspension rates. Weber finds the school King helped start, “not only has the second highest suspension rate in greater Boston; it’s the second largest in the state. The only school with a higher suspension rate is City On Hill,” also a school where King used to teach. According to data Weber shares, these schools have suspension rates that near 50 percent, while most public schools in his analysis have suspension rates that are far lower, well under ten percent. Further, Weber finds, as King’s influence extended beyond Roxbury to the network of Uncommon Schools he helped create, the tendencies toward high student suspension rates followed him. In Brooklyn, Weber finds Uncommon charters with suspension rates that exceed 30 percent, well above rates in public schools in the low single digits. Elsewhere in New York, Uncommon charters have suspension rates of 15 and 20 percent while the public schools in those districts have rates that are low single digit. The same is true in New Jersey. To dismiss any argument that these over-the-top suspension rates are a recent anomaly, and not attributed to King’s leadership since he is no longer at the helm, Weber updates his analysis to show these high suspension rates bear out throughout the history of these schools. What’s Wrong With School Suspensions? The high student suspension rates in the schools King helped create and preside over are indeed a cause for concern. 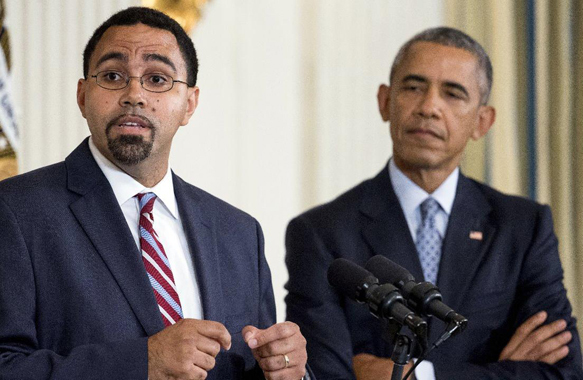 First, as Weber points out, they violate the standards of the very USDOE John King is now going to lead. A “School Climate and Discipline” page on the Department’s website states several reasons for not suspending students, saying they don’t work, they have negative consequences to the student and the school climate, and there are better alternatives. We all know there are things to like about John King. One bit of news about him that is particularly heartening is that in his turn as state commissioner he “used federal money to encourage schools to create more diverse student populations,” according to a report in the Washington Post. Pushing schools toward more racial integration is by all accounts a worthwhile goal. Yet there is a difference between taking a principled stand you’ve taken before and breaking from repeated practices from your past. On the issue of enforcing federal guidelines on student suspensions, it will be interesting to see how King will rule. But what we certainly don’t need are any more media-created narratives that because we think we know where King’s heart is, we can assume anything about where his head is.